It will come on 2016. 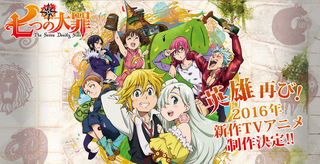 On the last chapter of The Heroic Legend of Arslan It has been announced that a new season of The Seven Deadly Sins will come on 2016. The Anime will be a continuation of where the things were left the past season. The Manga, to whom this Anime is based of, has won the 39th Kodansha Manga award in the Shonen Category.